If you are away from your computer for a while and lose connection to the Trello servers because your computer went to sleep, or you temporarily lose your network connection, a red box will appear in the right hand corner of the browser notifying you that you have been disconnected from the Trello server. Notifications that you have been disconnected from the Trello server. While you are disconnected from the Trello servers any edits that you make to your Trello cards will not be synced or saved to your boards. 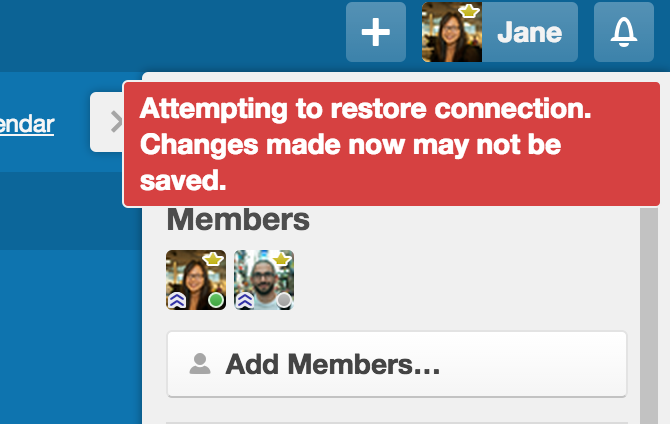 When you see this red warning box, check your network connection, and once it has been restored reload Trello before making any edits to your cards.